In the previous blog, we continued our discussion of the critical questions sales management should ask when it comes to closing must-win deals and explored “Why Will The Customer Want To Choose Us Right Now?” We discussed perhaps one of the most misunderstood concepts in business and was value. In this blog, we’ll provide a capstone to the first four sales management questions by exploring what I consider the definitive output of any selling process and that is the Value Proposition. Our goal should always be to present an Irresistible Value Proposition – one that will cause the customer to sit up, take notice, want what we’re selling and want it right now! However, we should first make a distinction between a “marketing value proposition” and a “sales value proposition” as I find many salespeople tend to equate the two, when they are really different things. The purpose or function of a marketing value proposition is to get the attention of a prospect – at least to the point where they will want to meet with us. A marketing value proposition might go like this “We can save you money…” or “We can reduce your time to market…” Either of these could very well capture the attention of someone who is trying to reduce costs or improve speed to market and therefore they’ve accomplished their purpose. A sales value proposition however is intended to help the customer make an informed decision. As such, it is specific to a customer, their particular situation, and the relevant outcomes they want to achieve. Its purpose or function is to get the customer to the point of wanting to buy from you. It would therefore answer the questions of “Which money will you save me, how much money will you save me and by when?” As we previously learned, if this is incrementally better than the customer’s most likely alternative, then we are presenting the prospect of real value to this customer. 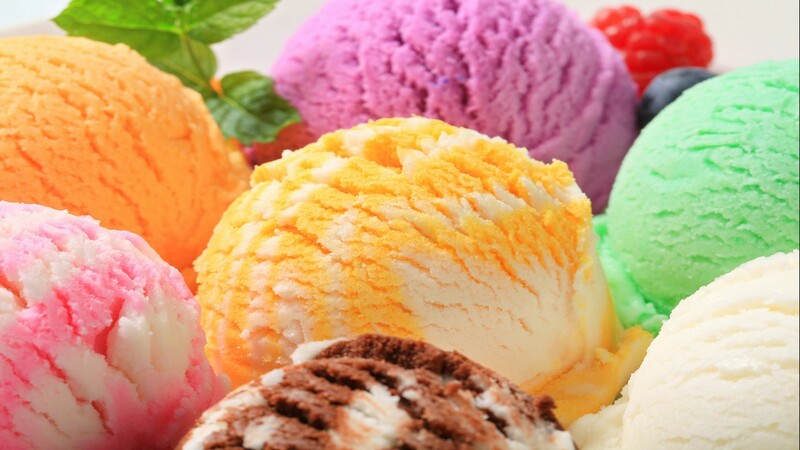 But what makes a value proposition truly irresistible? It has been my experience that the easier it is for the customer to understand and relate to your value proposition, the more irresistible it will be. In short, it will hit them between the eyes. 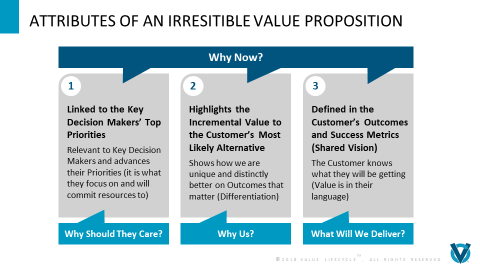 To accomplish this, your value proposition should have three attributes a shown in the figure below. First it should be clearly linked to one or more priorities of the key decision makers. By doing so it will answer “Why should they care what you are talking about?” Because they are focused on advancing their priorities, these are the items they are typically prepared to commit resources to and will have their attention. Second, it should highlight the incremental value to their most likely alternative. Don’t spend time talking about the stuff that is the same as everyone else as those are often “table stakes” in your industry and don’t confer any value as anyone can say it. To describe a feature or capability that one or more competitors possess confers no value to the customer. Rather, by focusing on the incremental value (especially as it relates to desired outcomes) you are answering the question of “Why they should care about you?” Now you are highlighting how you are unique and distinctly better in producing outcomes that are important to them. This is a valuable form of differentiation. Third, present your value proposition in the customer’s language using their terminology – not yours! It makes it easy for the customer to understand and answers the question of “What outcomes will you deliver?” Customers simply don’t speak your language and understand your acronyms. They speak their own language and have their own acronyms. Use them and they’ll believe you truly understand them and what they are trying to accomplish. Finally, taken together, these three attributes answer the question of “Why now?” Why should they want to buy from you right now? Because you are focused on something they care about. You are presenting real value to them. And you are making it easy for them to understand what you intend to deliver. Here is an Irresistible Value Proposition one of my clients crafted that resulted in a $12.5M sole source deal that closed in less than 10 days. “We will fully integrate your IT infrastructure two months ahead of the Board of Director’s deadline.” Because the SVP they presented it to was responsible for the integration and had been charged by the Board to complete it within a certain timeline, this especially resonated with him. As you can imagine, he was under a lot of pressure with a lot of personal capital at stake. Note too, that this value proposition did not focus on the how, but rather on the outcomes important to this SVP. In the next blog, we will continue with the critical questions sales management should be asking about must-win deals by delving into the question of “What is Creating Uncertainty?” Given the increasing complexity of B2B sales, we can never have perfect information and yet we must sell into uncertain situations. How will we manage the risks and uncertainty?